Our tubing is made from high quality silicone that is durable and will perform just the way it should. With no kinks when coiled and superb gripping on your fittings, Nitro Line is the real professionals choice. Hangar 9's new Ultra Fuel Pump can be used with both gasoline and glow fuel and features overdrive gearing and transfers fuel quickly. 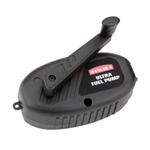 The pump is ergonomically designed to be easy to hold on to while fueling and comes with a two-year warranty, making it a fantastic value also. Hangar 9's Ultra Fuel Pump is a great addition to any field box.